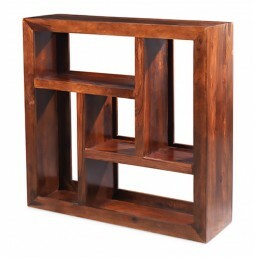 An exclusive collection of hand crafted solid sheesham furniture from India. 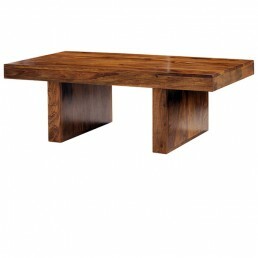 Indian contemporary modern design in fusion with the natural beauty of this most popular hardwood. Co-ordinated solid sheesham hardwood furniture for your living room and dining room. 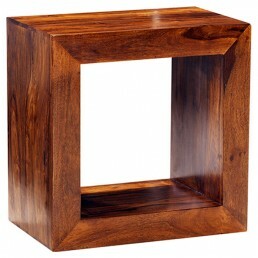 This sheesham cube furniture range is hand built using the best Indian rosewood from sustainable sources. 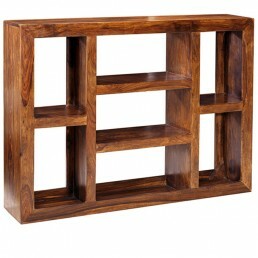 Cubic open shelving unit with 2 holes and 2 shelves. Can be stood vertically or horizontally. 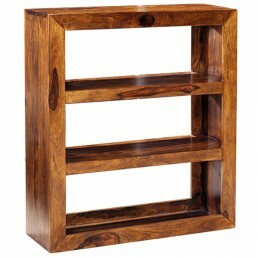 ..
Cubic shelving unit with 3 holes and 3 shelves. Can be stood vertically or horizontally. 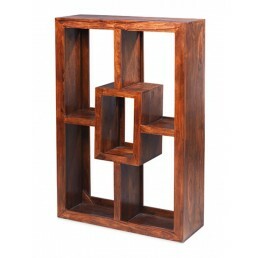 Thi..
Cubic open shelving unit with 4 holes and 2 shelves. This quality piece of furniture has con.. 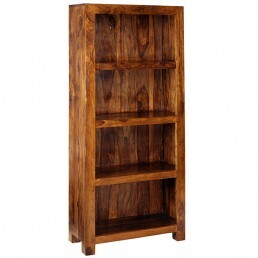 Tall large bookcase with 4 shelves and enclosed back. 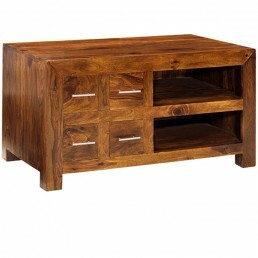 This quality piece of furniture has co..
CD/DVD media chest with 10 small drawers. 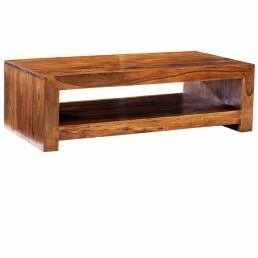 This quality piece of furniture has contemporary m..
Cube block coffee table with two legs. This quality piece of furniture has contemporary mode.. 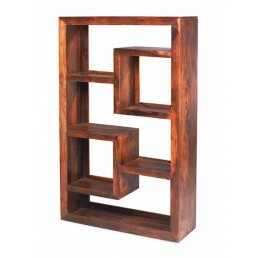 Built to last a lifetime this piece is hand-made in India from the best solid Sheesham hardwood w..
Cube nest of 3 space saving coffee tables, 1 large and 2 small. This quality piece of furnit..
Coffee trunk/table with 4 drawers on each side for useful storage. This quality piece of fur.. 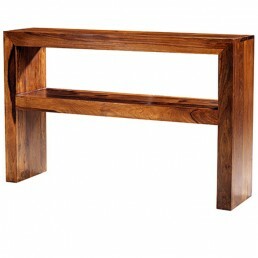 Simple console table with 1 shelf. 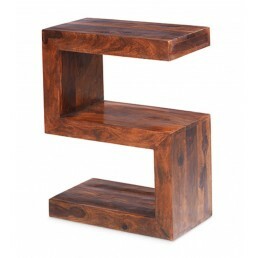 This quality piece of furniture has contemporary modern s.. 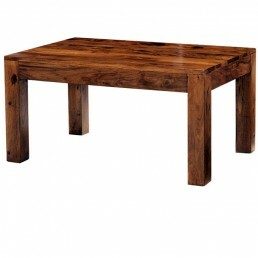 This quality piece of furniture has contemporary modern style design coupled with the rustic beau.. 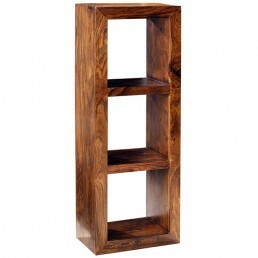 This geometric combination display unit or bookcase offers various options for storing books and .. 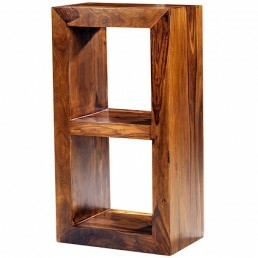 Ideal for end table, bedside table or small display unit. This quality piece of furniture ha.. 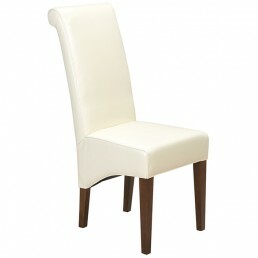 Dining chair upholstered in beige bi-cast leather. Built to last a lifetime this piece is ha.. 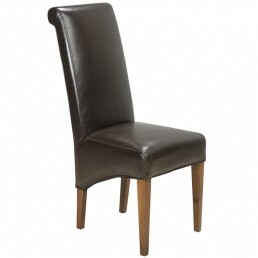 Dining chair upholstered in dark brown bi-cast leather. Built to last a lifetime this piece .. Dining chair upholstered in dark red bi-cast leather. Built to last a lifetime this piece is..
Large dresser with 7 shelves, 3 drawers and 2 cupboards. 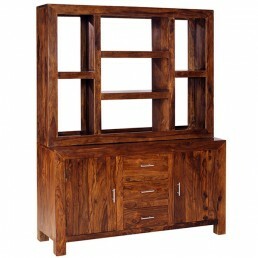 The top shelf unit is removable leaving ..
TV and media cabinet with 2 shelves and 4 drawers. 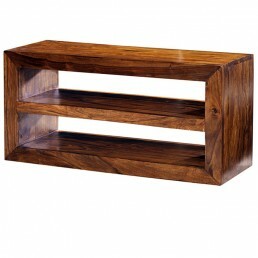 This quality piece of furniture has conte..
Open side display or media unit with two shelves. 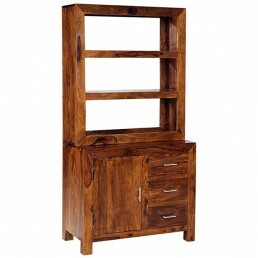 This quality piece of furniture has contem..
Large bookcase or display unit with 7 shelves. Can be stood horizontally or vertically. This.. Display unit with 3 shelves. 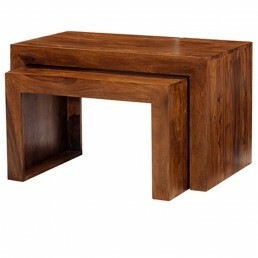 This quality piece of furniture has contemporary modern style d..
Table and space saving cube nest. 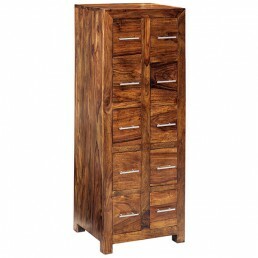 Built to last a lifetime this piece is hand-made in India ..
Large sideboard with 3 drawers and 2 doors with internal shelving. 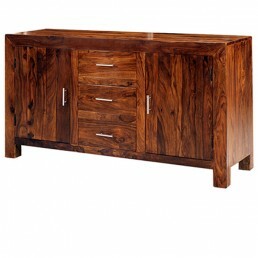 This quality piece of fur..
Cube small sideboard with 1 cupboard and 3 drawers. 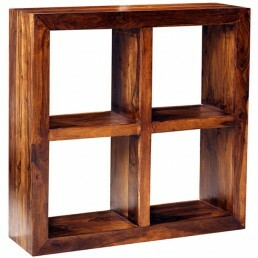 Built to last a lifetime this piece is h..
Cube coffee table with magazine shelf. 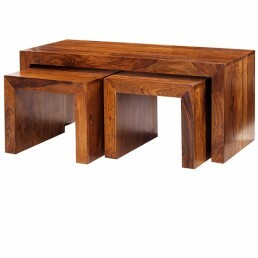 Built to last a lifetime this piece is hand-made in I..
Cubic nest of 2 space saving coffee tables. 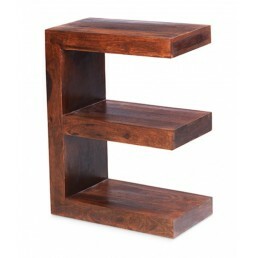 This quality piece of furniture has contemporary.. 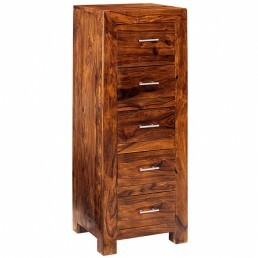 Tall chest with 5 drawers. 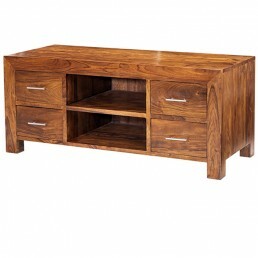 This quality piece of furniture has contemporary modern style des..
Cube TV cabinet with 2 shelves and 4 drawers for DVD's. This quality piece of furniture has .. 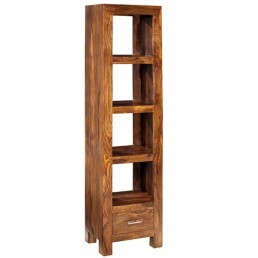 Tall slim bookcase with 4 shelves and 1 drawer in the base. This quality piece of furniture ..
Dresser with 3 shelves, 3 drawers and 1 cupboard. 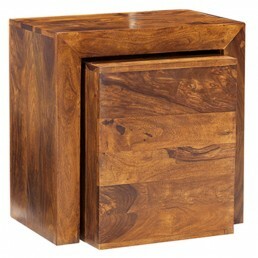 Top portion can be removed leaving a small side..
Cubic storage cube. 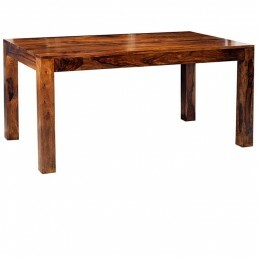 This quality piece of furniture has contemporary modern style design cou..
Sheesham wood, also recognised as Indian rosewood or dalbergia sisso is the timber of a deciduous tree indigenous to the Indian Subcontinent. 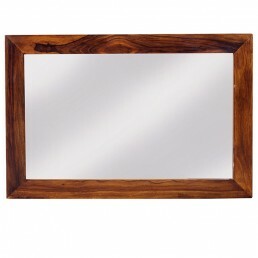 Succeeding teak, it is the most important cultivated timber tree from the Punjab region, which is the largest producer of Sheesham timber in India and Pakistan. Apart from timber supply, the tree is cultivated along roadsides and canals which brings a welcome, natural shade for tea plantations. It is also often planted in southern Indian cities such as Bangalore as a street tree. With its high tolerance of cold weather and long, hot dry seasons, this species is ideal for sustainable forestry, agroforestry and deciduous reforestation. Sheesham is kiln dried before being utilised in furniture making and this process is commonly known as seasoning. Locally to where it is grown sheesham timber is kept outside to dry up under the sun for around 6 months. Commercially sheesham is often seasoned in kilns with hot air circulation for about 7 days to 15 days for optimal seasoning. 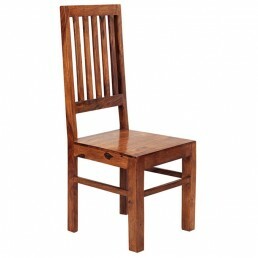 Why is sheesham wood favourable for furniture making? Sheesham hardwood wood features an alluring irregular grain formation which is most distinctive in appearance and can be polished to an elegant and durable finish. 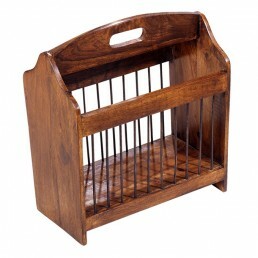 The wood itself is robust and durable, maintaining its original form during handling and construction. These properties make it an ideal material for cabinet making. 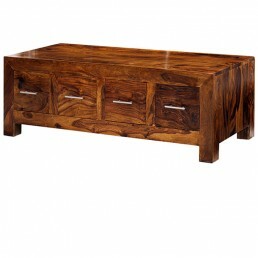 We work closely with our suppliers specialising in Sheesham wood furniture. Timbers are sustainably obtained via managed plantations. The wood is carefully kiln-dried and treated to protect its future stability before production starts. 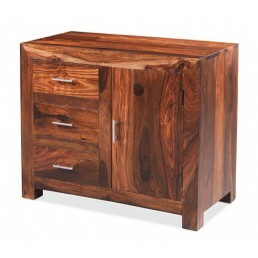 Our furniture is built from both the dark heartwood and the lighter-coloured sapwood of the tree. A stain is carefully applied to obtain the desired tone before hand waxing to enhance the beautiful grain. As this furniture is hand finished from an entirely natural product, variations in knots and grains will be evident making each piece, charmingly, characteristically unique.